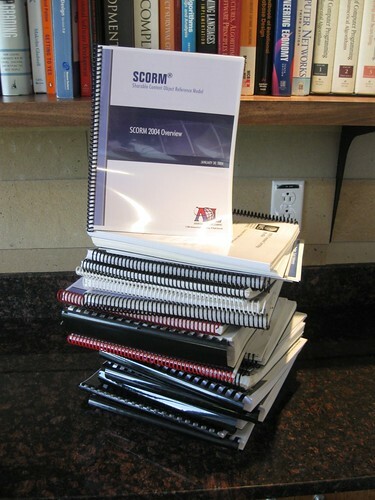 Before we bought 30 inch monitors for everybody, we used to print out all of the SCORM specs as they came out. The hard copy made them a whole lot easier to digest even though it meant the slaughter of many innocent trees. In unpacking the last boxes in our new office today I came across all of them. It makes a nice visual for why it makes sense to work with Rustici Software if you’re serious about providing standards support.